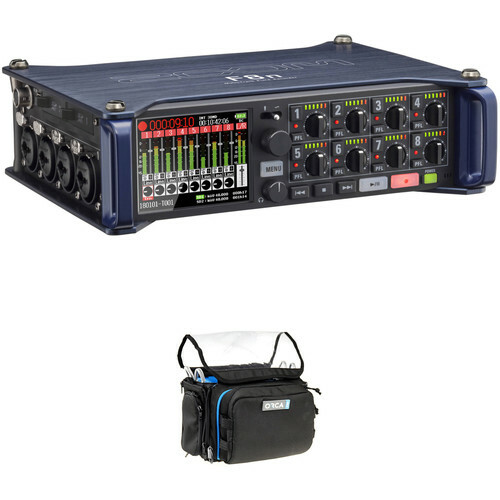 Bundled by B&H for your convenience, this Zoom F8n Multitrack Field Recorder Kit provides the aforementioned field recorder and an ORCA OR-28 Mini Audio Bag for carrying it. The recorder offers eight XLR-1/4" combination inputs with +75 dB of gain, as well as the ability to record 10 tracks simultaneously at sample rates and resolutions of up to 192 kHz/24-bits. The ORCA OR-28 Mini Bag sports an internal honeycomb frame to protect the F8n, as well as a transparent TPU top, two handles, and multiple pockets. Two pockets are on hand for your accessory gear, and you can position the F4 in multiple ways within the bag. The Zoom F8n Multi-Track Field Recorder is designed for professional and enthusiast recording applications on set and in the field, including music, filmmaking, and electronics news gathering (ENG). Designed to be carried by a shoulder strap or in a bag, the unit features eight analog input channels with XLR/TRS combo jacks that provide +75 dB maximum input gain, and support for line-level inputs. It can record up to 10 tracks simultaneously (channels 1 through 8 plus a stereo mix), or up to eight channels when recording at the A/D converter's maximum 24-bit 192 kHz resolution. When operating via USB, the unit can be used as an 8-in/4-out audio interface at sample rates up to 96 kHz. A built-in slate mic allows you to make voice memos and the unit's slate tone can be used to confirm specific levels. Proprietary Zoom capsules can be plugged into the unit, so you can record stereo straight to the F8n. The F8n can record to an SD card and your computer via USB simultaneously, and you can easily back up your files and stream live while recording. You can also record to two SD cards at once for simultaneous, redundant recording, ensuring you're capturing all the audio all the time. The unit can be used as an 8-in/4-out audio interface at sample rates up to 96 kHz. 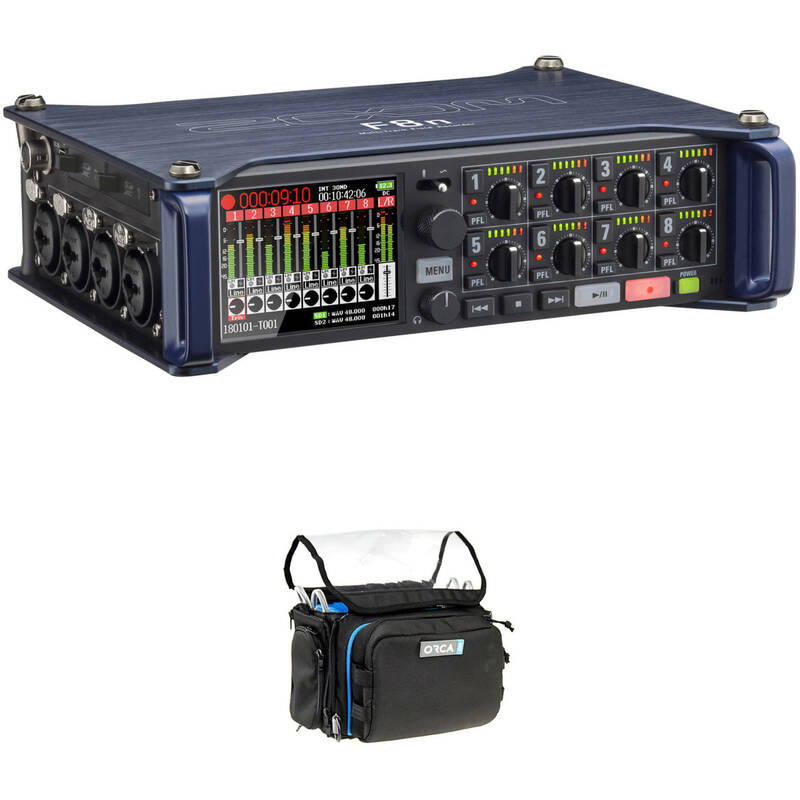 The Orca OR-28 is a carry bag intended for Zoom F8 field recorders, as well as the Zaxcom Max mixer, the Tascam DR70, and other compatible devices. It features an internal honeycomb frame which can securely hold your recorder/mixer, as well as other gear such as wireless transmitters. The bag gives you a transparent TPU top for easy viewing; this top can be placed however you'd like to facilitate readability on the job. Additionally, the bag is accessible from six different angles, allowing you to access and arrange gear however you choose. Two pockets are on hand for ancillary gear, such as headsets, cables, and batteries. The OR-27 sports two handles, as well as an included shoulder strap. The inside of the OR-28 provides options for positioning your mixer in one of two ways; you can make use of a sponge or two lifts. The two features help you adjust your recorder/mixer to the positioning you need. The OR-28's sliding buckle system secures your mixer/recorder in place. Zoom Mic Capsule disables Input 1 and 2. Box Dimensions (LxWxH) 12.4 x 11.1 x 9.4"